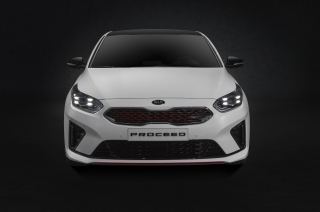 Carrying the name over from the second-generation Kia pro_cee’d three-door coupé, the ProCeed has been designed, developed and engineered in Europe. A product of Kia’s European design, product development and R&D teams in Frankfurt, Germany, the ProCeed will be manufactured at the brand’s Žilina production facility in Slovakia. It will be built alongside the Kia Ceed and Ceed Sportswagon, first introduced earlier this year. 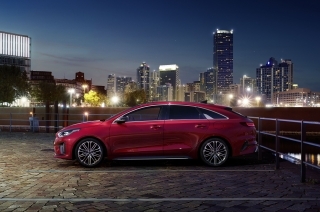 Matching the daring design and engineering which renders it the sportiest iteration of the new Ceed model family, the Kia ProCeed will be available exclusively as a ‘GT-Line’ or high-performance GT model. Production of the ProCeed shooting brake begins in November, and sales commence exclusively across Europe in the first quarter of 2019. It will be covered by Kia’s quality promise, with the brand’s industry-leading 7-Year, 100,000-mile warranty as standard. Full UK specification, pricing and on-sale date will be announced in due course. The Kia ProCeed encapsulates the spirit and athleticism of the second-generation Kia pro_cee’d hatch. 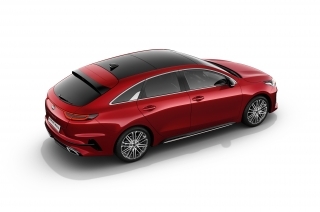 A shooting brake by design, the ProCeed presents an alternative to the traditional three-door hatch, and marries its imposing proportions with a compact footprint that hints at its outright agility. With the DNA of a coupé, the ProCeed is lower and longer than both the Ceed five-door hatchback and Sportswagon. Yet, it combines its striking visual presence with a dash of versatility, giving it a unique raked-back silhouette unlike anything in the family car segment. 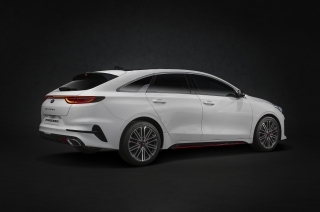 The ProCeed has been designed at Kia’s European design centre in Frankfurt, Germany, under the direction of Gregory Guillaume, European Head of Design, and Peter Schreyer, President of Design and Chief Design Officer. Gregory Guillaume comments: “Europe’s shrinking market for three-door hatchbacks brought the future of the pro_cee’d in question. But it was equally inconceivable that we would simply kill off the pro_cee’d. It was not just the name we gave to our three-door cee’d - it meant so much more than that. It embodies all Kia's values of youthful dynamism, of emotional engagement, and of design-led desirability. The ProCeed will be available as a ‘GT-Line’ or high-performance GT model, a brief which enabled Kia’s European design teams to create a confident and sporty design for the halo model of the Ceed family. Low, lean and lithe, its stance and proportions are different, sharing only its bonnet and front wings with the Ceed five-door. With its own individual style and character, every other panel is new. Yet the ProCeed features many of Kia’s now familiar design motifs, and its ‘family face’ is instantly recognisable. 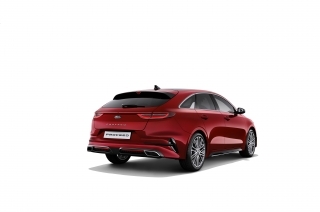 With the iconic ‘tiger nose’ grille and wide lower air intake, the castellated windscreen, and the brand’s inimitable mix of taut creases and curvaceous sheet metal, it is every bit the contemporary Kia. 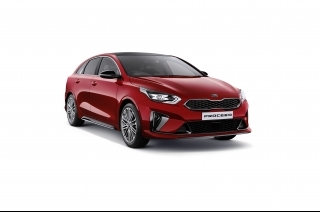 Like the Ceed, the front of the ProCeed is built around precise, linear shapes, with ‘ice cube’ LED daytime running lights as standard, echoing the appearance of earlier Kia GT and ‘GT-Line’ models. The new model retains the same 1,800 mm width as the Ceed five-door hatchback, but features its own unique front bumper design. In profile, the ProCeed is informed by the design of the 2017 Kia Proceed Concept, mirroring its silhouette with a raked roofline that flows elegantly downwards into the rear shoulders. Taut creases run the length of the car, trailing from the headlamps to the tailgate to extend its visual length. It carries over the window line from the 2017 concept car, including the acutely angled chrome ‘Sharkblade’, emphasising the dramatic roofline. Its steeply raked rear windscreen separates it from its siblings in the Ceed model family, as well as other cars in its class. The rear windscreen of the Ceed Sportswagon is angled at 50.9° off-vertical, while the five-door hatch windscreen sits at 52.4°. A defining element of its coupé-like shape, the rear window on the ProCeed is more horizontal, angled at 64.2° off-vertical. At 4,605 mm long, the ProCeed is 5 mm longer than the Ceed Sportswagon, with a longer 885 mm front overhang. At 1,422 mm in height, its roofline sits 43 mm lower than that of the Sportswagon, while ground clearance is reduced by 5 mm, to 135 mm. Constructed on the same ‘K2’ platform as other Ceed models, the 2,650 mm wheelbase remains unchanged. The rear of the car is what differentiates it fully from other models in the Ceed range, inspired by the layout of the 2017 Proceed Concept. 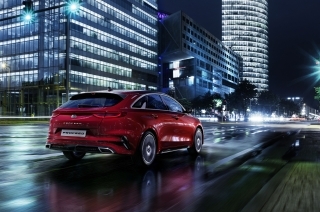 Combined with its lower overall height, the new wide rear bumper gives the car an assertive, sporty stance, with dual-tip exhausts for GT and ‘GT-Line’ models enhancing its sense of dynamism and sportiness. The ProCeed name is spelled out in capitals across the centre of the tailgate, beneath LED tail-lights which span the width of the tailgate – giving the car a unique light signature. From launch, the ProCeed across Europe will be available in a choice of 10 paint finishes. The ProCeed ‘GT-Line’ will have 17- or 18-inch aluminium alloy wheels, while ProCeed GT models are fitted with 18-inch wheels as standard. Kia’s 7.0-inch ‘floating’ touchscreen infotainment system sits at the centre of the dashboard, with audio and heating and ventilation controls situated below. The dashboard itself is angled slightly towards the driver. The ProCeed diverges from other models in the Ceed family line-up with a series of changes designed to introduce a sportier ambience to the cabin. The grey roofliner of the Ceed and Sportswagon is replaced with black cloth to envelope and cocoon occupants, and the door sills feature metallic scuff plates. It is fitted with a D-shaped steering wheel as standard, and – for models equipped with Kia’s double-clutch transmission – drivers change gear with new metal alloy steering wheel paddles. The ProCeed has different front seats, depending on specification – with Kia’s ‘GT’ logo stitched into each. ProCeed GT models feature Kia’s new sports seat, with larger, firmer side and thigh bolsters compared to the original cee’d GT. Trimmed in black leather and suede the GT’s seats are finished with red stitching and GT logo. For the ProCeed ‘GT-Line’, the standard front seats feature larger side bolsters than those found in the conventional Ceed and Sportswagon, trimmed in black cloth and light grey synthetic leather. There are GT-style seats, with the same side and thigh support as the high-powered GT model, finished in black leather and suede with grey stitching. The ProCeed’s platform supports the car’s efficient packaging, creating ample space for occupants in the front and rear. For rear passengers, the lower hip-point (compared to Ceed and Sportswagon models) offsets the effects of the ProCeed’s lower roofline, creating head and leg room aplenty. The ProCeed offers more luggage capacity than many conventional compact family wagons – and even many tourers from classes above. With a capacity of 594 litres (VDA), the ProCeed’s boot is 50 per cent more capacious than that of the Ceed five-door hatchback. With no boot lip and a lower ride height than the Sportswagon, the low lift-over height of the shooting brake tailgate also makes it remarkably easy to load and unload. While the Ceed Sportswagon’s boot is marginally larger, at 625 litres, the ProCeed offers identical versatility features, making it one of the most usable cars in its class. These include 40:20:40 split-fold rear seats, folded with a single touch from a lever just inside the tailgate. With the seats folded, the boot floor is flat. An underfloor storage area can stow smaller items and the boot features a bag hook to prevent groceries and other items rolling around the load bay. The Smart Power Tailgate opens automatically when it detects the ProCeed’s smart key in close proximity to the tailgate, for occasions when users’ hands are full with heavy cargo. The load bay features a net to secure small items, as well as a luggage floor rail system. The ProCeed has been engineered and developed exclusively for European roads and European drivers. Europe is characterised more than any other continent by its diversity of driving conditions: high speed motorways, zigzagging alpine routes, congested city centres and winding country lanes. The ProCeed has been developed to master all these environments, and has been tuned to offer greater dynamism, driver engagement and confidence, and cruising comfort than earlier generations of cee’d. 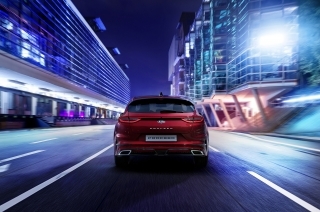 Accordingly, every Kia ProCeed is fitted with fully-independent suspension as standard, bucking the trend for other mid-size family cars to offer the more advanced multi-link rear suspension as an expensive option. Built around the same suspension system found in the Ceed and Ceed Sportswagon, the ProCeed offers a unique state of tune compared to its siblings. Matching the sleek design, it seeks to provide drivers with agile and immediate handling responses, close body control under cornering, and a blend of comfort and unwavering stability at high speeds. The ProCeed’s ride height – for both GT and ‘GT-Line’ models – is 5 mm lower than the Ceed and Sportswagon, with spring and damper rates tailored to accommodate its shooting brake dimensions and cab-rearward design. 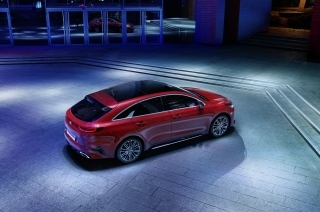 The development of the ProCeed GT’s ride and handling was overseen by Albert Biermann, President of Hyundai-Kia Vehicle Test & High-Performance Development. The ProCeed is fitted with the same fully-independent suspension hardware as the Ceed. However, additional fine-tuning to the suspension geometry has given the ProCeed its own unique character within the Ceed range. 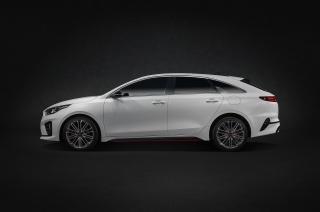 Kia's development engineers focused on enhancing the agility and responsiveness of the suspension, while retaining the relatively relaxed gait that owners would expect of the 'grand touring' shooting brake body. The suspension has been tuned to accommodate its longer body and cab-rearward dimensions, and ensures the ProCeed remains as engaging and confidence-inspiring to drive on a winding country lane as it is on the motorway. The ProCeed GT has been engineered at the direction of Albert Biermann, Head of Kia’s Vehicle Test and High Performance Development. A further six months of additional testing has further enhanced its cornering agility and yaw behaviour, and increased traction and steering responsiveness. This has been achieved with the adoption of stiffer front and rear springs to increase body control and improve steering inputs, and softer front and rear anti-roll bars to keep its inside wheels in contact with the road, even under hard cornering. These changes mean ProCeed GT drivers can enjoy faster cornering speeds than many more powerful front-wheel drive ‘hot hatches’, while revelling in the ‘gran turismo’ spirit of everyday usability that defines all Kia GT models. Every ProCeed, regardless of wheel size, is available with Michelin Pilot Sport 4 tyres, which enable higher yaw velocity than other mid-size family cars. Kia’s European test drivers chose the tyres specifically to support and enhance the ProCeed’s responsive, engaging handling. The car features electric motor-driven power steering, offering incisive responses to steering inputs with a fast 12.7:1 ratio and requiring only 2.44 turns lock-to-lock. 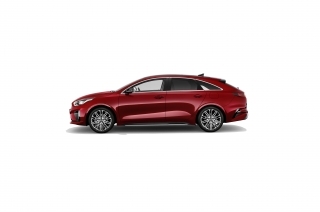 Technology in the ProCeed also plays a role in enhancing both driving enjoyment and safety, with Electronic Stability Control (ESC) and Kia’s Vehicle Stability Management (VSM) system as standard. This enables the inclusion of Torque Vectoring by Braking technology, an electronic driver support feature which intelligently brakes the inside wheels to reduce understeer around corners. The technology makes the ProCeed more enjoyable and confidence-inspiring to drive on the type of winding lanes and mountain passes upon which it has been developed. The ProCeed is powered by a wide choice of engines, to meet the powertrain expectations of European buyers – who are increasingly familiar with fast-revving, highly efficient turbocharged engines that offer immediate acceleration and a broad spread of torque. The ProCeed ‘GT-Line’ is available with a choice of three engines. Petrol options include Kia’s popular 1.0-litre T-GDi (Turbocharged Gasoline Direct injection) engine, producing 120 ps and 172 Nm torque. The most powerful engine for ‘GT-Line’ models is the brand’s all-new ‘Kappa’ 1.4-litre T-GDi power unit, which produces 140 ps. The engine’s turbocharger ensures its 242 Nm torque output is available over a wide 1,500-3,200 rpm band, making it responsive in a wide range of driving conditions. Both engines are fitted with a particulate filter to reduce tailpipe emissions, ensuring the ProCeed goes beyond the requirements of the Euro 6d TEMP standard. Both engines offer a six-speed manual transmission as standard, while the 1.4-litre T-GDi is available with Kia’s seven-speed Dual-Clutch Transmission. Buyers can specify an efficient all-new ‘Smartstream’ 1.6-litre CRDi (Common-Rail Direct injection) diesel engine. Kia's Smartstream powertrain philosophy seeks to enhance fuel efficiency and performance with reduced emissions. The Smartstream engine has been developed with an optimised powertrain structure and design, compact and lightweight components, and enhanced combustion technology, maximising fuel efficiency and driving performance. 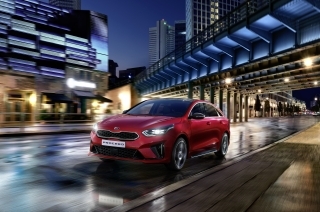 The 1.6-litre diesel engine in the Ceed and ProCeed is the first Smartstream diesel engine from Kia, and the company's cleanest diesel engine to-date. With a power output of 136 ps, the 1.6-litre Smartstream engine can be paired with a six-speed manual or seven-speed Dual-Clutch Transmission. It produces 280 Nm when paired with the manual transmission, and 320 Nm with the seven-speed Dual-Clutch Transmission. Designed to go beyond the stricter limits laid down by the latest Euro 6d TEMP emissions standard, the Smartstream engine uses Selective Catalytic Reduction (SCR) active emissions control technology to regulate emissions. 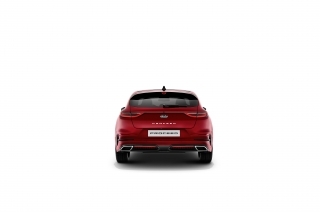 Marking the return of Kia’s high-performance ‘GT’ model, the ProCeed GT is powered by a 1.6-litre T-GDi engine, identical to that found in the Ceed GT. Producing 204 ps and 265 Nm, it is the most powerful engine in the line-up. 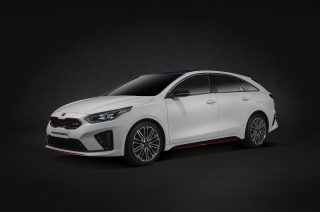 The ProCeed GT and Ceed GT also see the introduction of Kia’s seven-speed Dual-Clutch Transmission for the first time, enabling quick-fire gear shifts via the metal alloy steering wheel paddles. Kia will release official acceleration and top speed figures once the homologation process is complete. Like the Ceed, technology provides key benefits to ProCeed ownership, with a range of innovations designed to make life easier, more comfortable and safer on the move. The ‘floating’ infotainment system is available as either a 7.0-inch touchscreen audio system or 8.0-inch touchscreen satellite navigation system, with navigation and Kia Connected Services powered by TomTom®. The system enables full smartphone integration with Apple CarPlay™ (for iPhone 5 and onwards) and Android Auto™ (for Android phones running 5.0 (Lollipop) or higher). Depending on specification, a powerful JBL® Premium sound system with Clari-Fi music restoration technology is available. Standard technologies include full Bluetooth® smartphone integration, automatic lights, and keyless entry. For models equipped with a seven-speed Dual-Clutch Transmission, the Drive Mode Select system enables owners to tailor their driving experience. Switching between Normal and Sport modes, Drive Mode Select alters the level of effort required to steer the car, and subtly changes the character of the powertrain. Normal mode maximises the potential for greater fuel efficiency and offers more relaxed steering inputs. Sport mode enhances throttle responses, enables faster acceleration – from a standstill and at speed – and adapts the steering to offer additional weight and more decisive responses to inputs. It also holds on to gears for longer under harder acceleration, allowing drivers to make the most of the car’s peak power. A heated windshield uses nearly-imperceptible wires to gently heat the glass, making the car easier to live with in colder months by melting away frost, ice and windscreen mist at the push of a button. A wireless smartphone charger and heated front and rear seats are also available. Front-seat ventilation is also an option on ProCeed ‘GT-Line’ models. The ProCeed is available with Lane Following Assist, which tracks vehicles in front in traffic, and detects road markings to keep the car in its lane on the motorway. The system controls acceleration, braking and steering, using radar sensors to maintain a safe distance from the vehicle in front. Lane Following Assist operates between 0 and 180 kph.